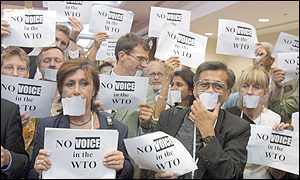 The successful conclusion of the World Trade Organisation meeting in Doha has not been greeted with universal applause. WTO chief Mike Moore said the pact was "historic" while US Trade Representative Robert Zoellick said the deal had removed "the stain" of past failures. However, environmentalist, anti-globalisation campaigners, business groups, countries and trading blocks have all expressed their varying degrees of enthusiasm for the new trade round. Indications are that heavy compromises were made to ensure that there was a result after the failure of the Seattle talks. Anti-globalisation campaigners were conspicuous by their absence in Qatar, which was chosen because of its geographic isolation and tight visa restrictions. Only a few 100 mainstream non-governmental organisations (NGOs) were present to lobby or quietly protest. And the Third World Network - which was barred from attending - described the agreement as "a massive defeat for poor people around the world". Jose Bove, the French farm activist and anti-McDonald's campaigner, agreed. "It's a victory for rich people over poor people," he told Reuters. Labour unions were also displeased after efforts to make the WTO take up workers rights were rejected. The labour issue was among several that sank attempts in the Seattle to launch a new round of talks. This fell well short of what trade unions, headed by the Brussels-based International Confederation of Free Trade Unions (ICFTU), were looking for. "This is a recipe for disaster," said Bill Jordan, ICFTU general secretary in Doha. In a speech on the sidelines of the conference, Mr Jordan warned that the 140 million workers represented by the ICFTU would align themselves totally with the anti-globalisation movement. Nearly all developing countries, which make up two-thirds of the 142-nation WTO membership, oppose linking labour standards to trade rules. They fear that labour rules would be used by the US and Europe to raise new barriers to their goods, which they produce more cheaply. Industrialised countries hailed the launch of the new round as a "slap in the face for isolationism". President Bush heralded the new round as "bold declaration of hope" that could boost the global economy. Meanwhile, British Prime Minister Tony Blair said: "The countries of the world, rich and poor, have ironed out their differences to launch a trade round that will make all of us more prosperous." But not all countries appear to agree with Mr Blair's assessment. "For a country like Chile, which has a very open economy and very low tariffs, what happened in Qatar is a bit disappointing," said Chile's President Ricardo Lagos. He warned that environmental issues could be "green barriers" - a quiet form of protectionism. However, India, which led developing nations, said it had made significant gains. Brazil, meanwhile, celebrated its role in brokering a deal on medical patents allowing poor countries better access to cheaper drugs to treat AIDS and other major killers. "This is a very important achievement for the developing countries, especially for the Sub-Sahara African countries," Nacer Benjelloun-Touimi, Morocco's WTO negotiator, said. The issue of patent rules - set out in the WTO's TRIPS intellectual property agreement - has been one of most contentious issues. Seven NGOs - including the Brussels-based Medecins Sans Frontieres, British-based Oxfam and the Third World Network of Malaysia - issued a joint statement applauding WTO recognition of the "lethal side-effects" of the TRIPS agreement. Drug firms reconciled themselves to the declaration, which they initially said would open the way to wholesale piracy of drugs and medicines. "It is a balanced package," said Harvey Bale, secretary-general of the Geneva-based International Federation of Pharmaceutical Manufacturers. In return for EU's concessions on agricultural subsidies, negotiators agreed to stronger language on linking trade and protecting the environment. "This is another example of very one-sided globalisation," said FoE in a statement. "We don't need a new trade round nor new issues, we need a review that enables sustainable development to be reflected in all trade rules." This was a sentiment echoed by Greenpeace which staged a protest inside the meeting.